I just bought the SL MkII, should I download the latest Automap installer from the Novation website? Yes, it is always recommended that you download the latest Automap installer from the Novation website (rather than using the disc that came in the box) as it will ensure that you have the latest version of software installed on your system. 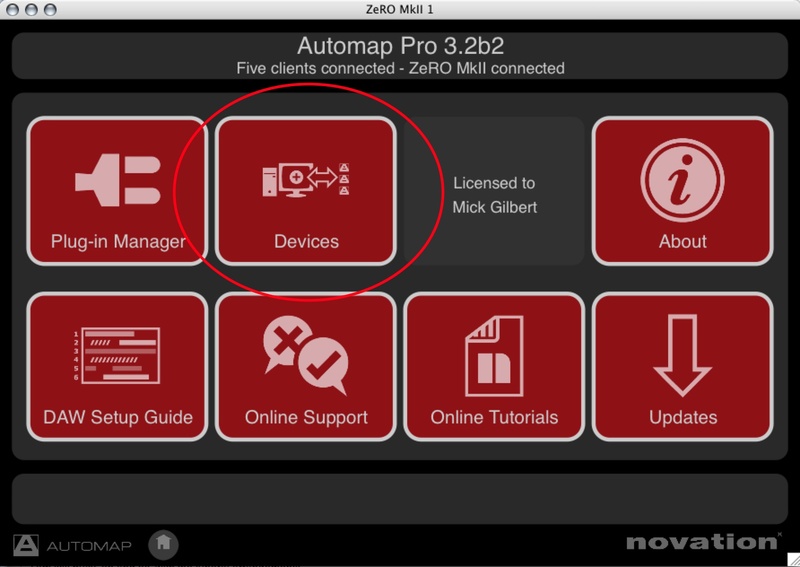 The latest Automap installer can be download here. How do I restore the OS and Automap Settings / templates on the SL MK II and Zero SL MK II? 1/. To get to the startup view, click on the home icon at the bottom of the Automap server. 2/. Select the devices menu. 3/. Select the relevant device. 4/. On the hardware, go to the "GLOBAL" menu and ensure that "MEM PROT" is set to "OFF". 5/. Then, press "WRITE" on the SL MkII and follow the LCD screen txt to ensure that you save the global settings on the hardware. 6/. Select the "Update System Settings" - This will restore the most up to date settings regardless of how the unit came from the factory. 7/. Follow the instructions in the Automap server. 8/. Turn "MEM PROT" back on in the global menu to ensure that your templates and settings can not be overwritten by accident. How do I turn off touch sensitivity on the SL MK II? If you press the 'global' button once, then touch/press the 1st encoder/button on the left side of the SL MkII, which correspond to 'Option'. Once you're in the Option menu, you can turn off touch sensitive by pressing/turning the 5th buttons/encoder, labeled 'TouchSel'. My SL MK II LCD screen reads 'NEED MIDI OS' and is frozen. What should I do? Now drag and drop the two sysex files (OS and Data) into sysex librarian. Then you can load the "data.syx" file into sysex librarian, although this time you should be able to select the SLMkII "port 1" in sysex librarian and send this direct to the unit via USB. This does not require the SLMkII to be put into receive mode but "memory protect" needs to be set to "OFF" in the "global" menu. Then you can load the "data.syx" file into MIDIOX, although this time you should be able to select the SLMkII "port 1" in "Select MIDI devices to open" and send this direct to the unit via USB. This does not require the SLMkII to be put into receive mode but "memory protect" needs to be set to "OFF" in the "global" menu. How do I navigate templates on the SL MK II? The SLMkII has two main Modes of operation: â€˜Automap Modeâ€™ and â€˜Advanced Modeâ€™. These are both accessed via the main â€˜Automapâ€™ button. How do I set up my SL MK II with Ableton Live? 1. Make sure you have Ableton Live 5.2 or later. If you need to update Live then you can download the latest version from www.ableton.com. Live 6, 7 and 8 are also supported. 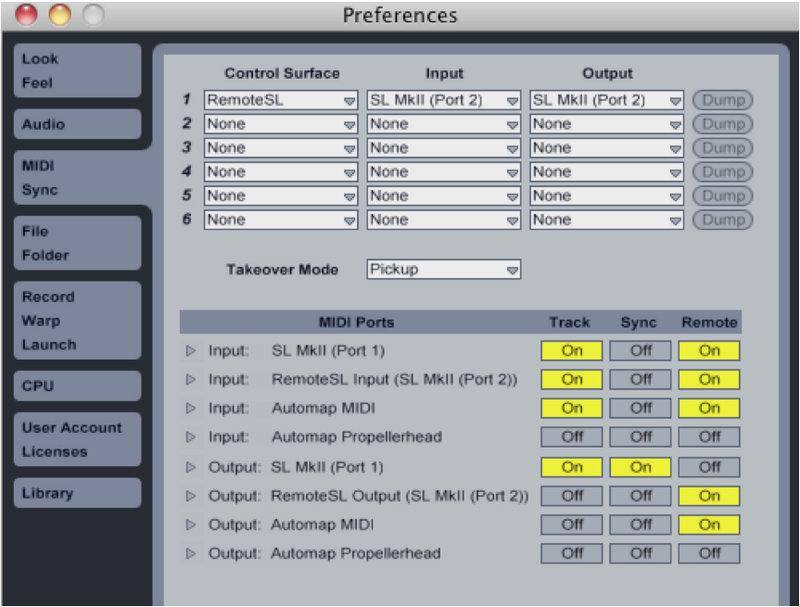 NOTE: The Input AND Output of the SL MkII in the â€˜Control Surfacesâ€™ section must be set to SL MkII (Port 2). 3. Exit the preferences and start using Live! The Ableton template must be selected on the SL MkII when using it in Ableton Live Automap mode. Once you have followed the above setup instructions the SL MkII will automatically switch to the Ableton Live Automap template and will do so each time you launch Live. Whilst using the SL MkII in Ableton Live Automap mode, you can switch to any other template on the unit (for example to control hardware MIDI devices or Automap-wrapped plug-ins using the Automap template) and then switch back to the Ableton Live Automap template to control Live again. 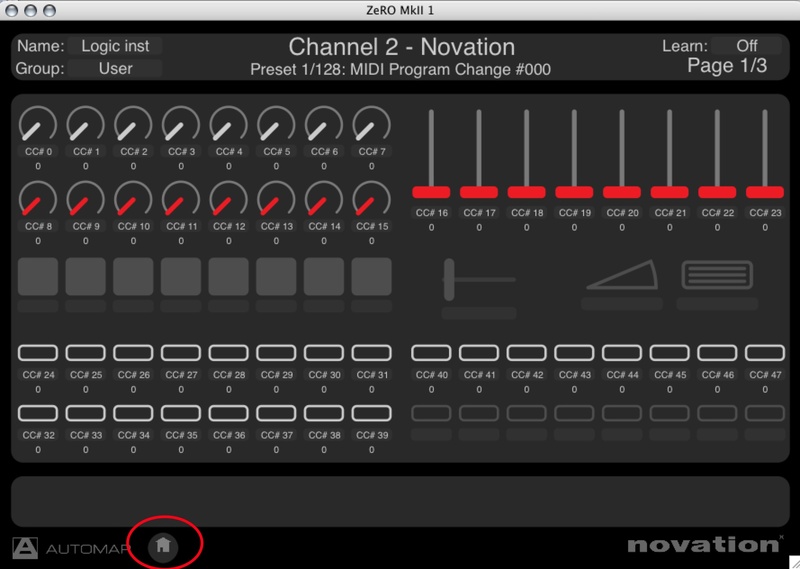 The pots and bottom left-hand row of buttons on the SL MkII are not assigned to any parameters in Live however they are set to send MIDI CC messages, meaning that you can assign them to parameters in Live as you like using Liveâ€™s MIDI learn feature (click on â€˜MIDIâ€™ in the top right-hand corner of the Live window). The plug-in parameters will then appear on the left-hand SL MkII display. 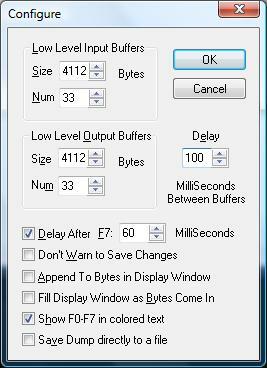 Use the LEFT-HAND SCROLL buttons to scroll through pages of plug-in parameters. The 8 encoders can be used to control the parameters shown and the top left-hand row of buttons can be used to return them to their default value or, for the â€˜DeviceOnâ€™ parameter, toggle the plug-in on/off. 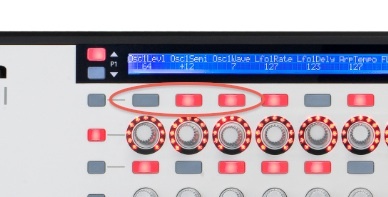 To lock the SL MkII to the currently selected plug-in press the ROW-SELECT button for the upper left-hand buttons. The LED next to the button will light to indicate that the SL MkII is locked to a plug-in in Live. Press the ROW-SELECT button for the upper left-hand buttons again to unlock the SL MkII. 1. Press and hold the EDIT mode button and hit the drum pad whose settings you want to change, then release the EDIT mode button. 2. Set the Note parameter to the new value. 3. Repeat steps 1 and 2 for all other drum pads. 4. Press WRITE 3 times to save the settings and then the PLAY mode button to return to Play mode. How do I edit the individual buttons, rotaries and faders on my SLMKII and Zero SL MK II? Press and hold the EDIT button then press the desired control on the unit. This will bring up a list of parameters you can change for that control. Press WRITE to save changes and ensure your MEMORY PROTECT is off. 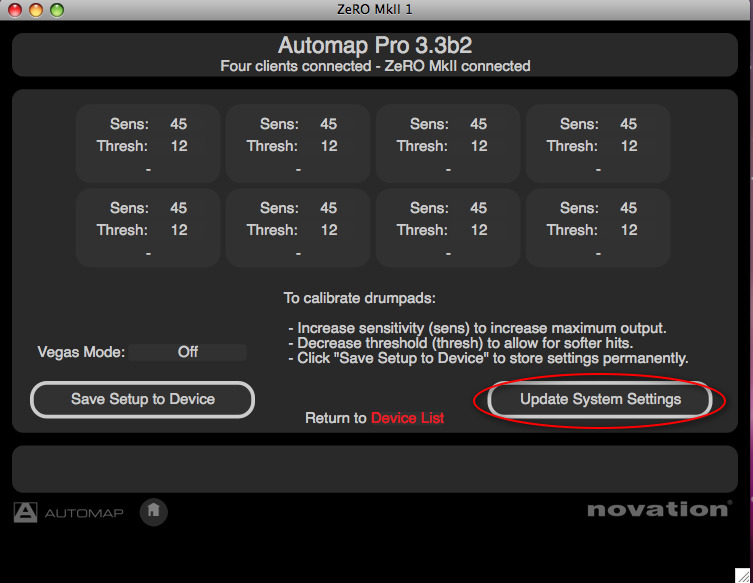 Please open Automap's Main menu and click on DEVICES then select your controller. CLick on UPDATE SYSTEM SETTINGS and follow the on screen instructions.